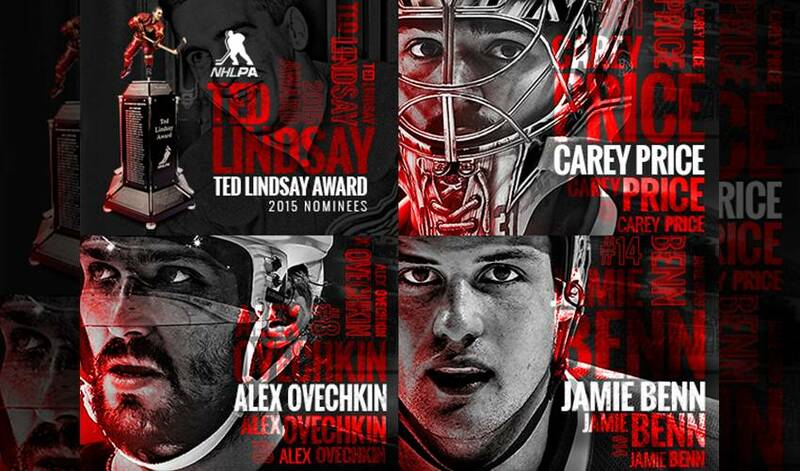 TORONTO (May 5, 2015) – The National Hockey League Players’ Association (NHLPA) announced today the three finalists for the Ted Lindsay Award: forward Jamie Benn of the Dallas Stars, forward Alex Ovechkin of the Washington Capitals and goaltender Carey Price of the Montreal Canadiens. The Ted Lindsay Award is presented annually to the “Most Outstanding Player” in the NHL, as voted by fellow members of the NHLPA. Benn and Price are each seeking their first Ted Lindsay Award, while Ovechkin is looking to be named the “Most Outstanding Player” by his fellow players for the fourth time in his career. The 2014-15 Ted Lindsay Award recipient will be announced on June 24th during the 2015 NHL Awards from the MGM Grand Garden Arena in Las Vegas. Jamie Benn, of Victoria, British Columbia, Canada, played in all 82 regular season games for the Dallas Stars in 2014-15. Benn captured the Art Ross Trophy for leading the league in points (87), which he won with a four-point game – including his second hat-trick of the season – on the final night of the regular season. He set career highs in points, goals (35) and assists (52). Benn tied for first in the NHL in even strength points (59), tied for third in even strength assists (36), and he finished third in points-per-game (1.06), sixth in the league in assists, ninth in goals and 11th in average ice-time per game among all forwards (19:56). Benn is seeking his first Ted Lindsay Award as a first-time nominee, and he would become the first Stars player in franchise history to be honoured by his fellow NHLPA members. Carey Price, of Anahim Lake, British Columbia, Canada, played 66 games for the Montreal Canadiens during the 2014-15 regular season, and helped lead the Canadiens to the second best record in the NHL. Price led the league in wins (44 – a new franchise-best), goals-against average (1.96) and save percentage (.933), which earned him finalist nominations for the Hart Memorial Trophy and the Vezina Trophy. He also claimed the William M. Jennings Trophy, along with Corey Crawford of the Chicago Blackhawks. Price would become just the second Canadiens player to receive the players’ Award, following Guy Lafleur (1975-76, 1976-77, 1977-78), and he would also become only the third goaltender to receive the Award, joining Mike Liut (1980-81) and Dominik Hasek (1996-97, 1997-98). Price is a first-time nominee for the Ted Lindsay Award and he is the first goaltender to be nominated since 2011-12 (Henrik Lundqvist). Jamie Benn has picked up in 2015-16 where he left off last season, leading the league in scoring and earning the Kraft Player of the Week honours.